MELBOURNE, Australia -- Not until you have seen Ukraine in the summer, when the vast fields of sunflowers and corn ripen, do you understand the flag of this nation. The simple azure horizontal stripe at the top represents the sky and the yellow the fields below. 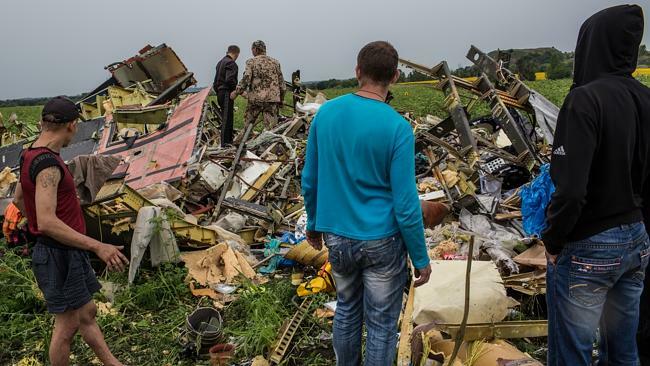 Men look at the wreckage of passenger plane Malaysia Airlines flight MH17. So it was on a warm day, July 17 last year, when a Russian-made SA11 BUK missile tore from the gold into the blue, ending the lives of 298 passengers, including 38 Australians making their way home from the Netherlands via Malaysia. Any doubt as to the horrific and reckless oversupply of heavy weapons across Russia and the former Soviet republic of the Ukraine, now the most eastern part of Europe, ended with those lives on that day. MH17 was flying over Ukraine directly into Russian airspace. In an area bristling with ballistic missiles, and where the skies are constantly monitored, Russian military air controllers knew the commercial jet was approaching. If the Russians and the military arm of the Ukrainian separatist movement are one and the same, it is difficult to accept the “terrible mistake” explanation that is so often told. It goes that a group of Russian-backed rebels were sitting inside the BUK mobile missile tank watching radar blips and, believing them to be a passing Ukrainian military cargo plane, fired the missile. Yet there was no good reason for a Ukrainian military plane, flying at such high altitude, to be so close to the border and headed directly into enemy Russia. Something about this story is wrong. Separatists and Russians argue the Ukrainians devised the slaughter in order to win international sympathy — and military assistance — by blaming Russia, only months after it had annexed the Crimea from the Ukraine. Into this mess walked the Dutch and Australian police investigators, adopting attitudes of careful indifference to the war. Yet they needed to get right into the middle of it. MH17 was brought to Earth deep in a conflict zone, where separatists had dug in around the crash site and were fighting Ukrainian troops over long distances via tank-to-tank, or cannon-to-cannon, combat. It is now accepted that in the immediate aftermath, the people of several small villages surrounding the epicentre of the crash zone, and separatists, rescued what bodies and human remains they could, along with possessions, piling them into train carriages. But an already terrible scene of carnage was amplified as outsiders descended on the wreckage to steal what they could. They found it easier to wander the site than Dutch and Australian police on a humanitarian mission. The aim was to recover the “remains of the remains”, as the AFP commander on the scene, Brian McDonald, described it, and negotiations were required to ensure they could enter without being caught in the crossfire. For all this, some good was extracted from the site, thanks to more than 200 Australian personnel, plus many more from other nations, who were able to bring some satisfaction to families by gathering wreckage that helped establish the cause, but most particularly by repatriating the further human remains. That may seem like small comfort, given that the searchers only confirmed what most families already knew to be true. However, had you seen one set of Australian parents who travelled to the crash site because of their complete refusal to believe that they had lost their beautiful daughter to a missile, you could see how important providing this grim confirmation was. It was not easy on the site. Ceasefires were not respected and heavy artillery fire ultimately repelled searchers who just wanted to take evidence home. Still, all Australian remains have now been identified. In fact, all but two of the people aboard the flight have been identified, a remarkable forensic achievement given that some victims were seated over the heaviest part of the plane, the landing gear, which hit and burned hardest. The murderers have no doubt long since slipped silently into Russia, well out of reach of international prosecutors. The chances are that the names of the guilty rebels, and their likely Russian military accomplices, are already known, but extracting them from Vladimir Putin’s Russia is a lot to hope for. Perhaps only the crushing pain of their guilt will bring them from their lairs.